Over 20% of American men and women suffer from chronic pain, but Do Chan, MD, MBA, and Boris Shwartzman, MD, are experienced pain management specialists who can provide relief. At Comprehensive Pain Management, Dr. Chan and Dr. Shwartzman along with their team bring the most advanced and innovative treatments for chronic pain conditions to four convenient locations in Massachusetts and Rhode Island. 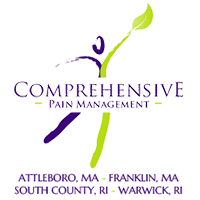 To find relief from chronic pain, call to schedule an appointment at Comprehensive Pain Management in Attleboro or Franklin, Massachusetts, or South Kingstown or Warwick, Rhode Island. When you’re experiencing pain, identifying whether it’s chronic or acute can affect your treatment options. In most cases, acute pain has an obvious cause and lasts 3-6 months. This type of pain usually improves after your injured tissue heals. In many cases, it’s also sharper and more severe. If your pain continues for more than six months, it’s considered chronic. Long-term medical conditions or wear-and-tear on your body often cause chronic pain. In some cases, acute pain can also become chronic, even when your injury has healed. The team at Comprehensive Pain Management has specialized training in managing chronic pain conditions. At Comprehensive Pain Management, Dr. Chan, Dr. Shwartzman and their team provide on-site care for a full range of chronic pain conditions, including back pain, joint pain, and migraine pain. How are pain conditions diagnosed and managed? Dr. Chan and Dr. Shwartzman along with their team diagnose acute and chronic pain conditions during a comprehensive evaluation. This visit often includes reviewing your medical history and previous tests, a musculoskeletal exam, and discussing your symptoms. Dr. Chan, Dr. Shwartzman and their team also offer procedures and interventional treatments at Comprehensive Pain Management, like trigger point injections, facet joint injections, and medial branch blocks. To learn more about chronic and acute pain management, call Comprehensive Pain Management or schedule an appointment online today.